The Made in Philadelphia Holiday Market Opens Saturday! 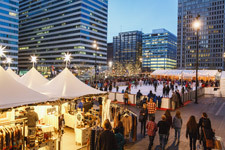 The market, at the south end of Dilworth Park, features local artisans, designers, crafters and confectionaries offering unique selections for gifts and special holiday foods in white, festively lit tents topped with original Herrnhut Stars. Open through December 24. For hours and more information, visit DilworthPark.org/madeinphiladelphia. The market was conceived and designed to complement Christmas Village in Philadelphia, which this year has a new home in the City Hall Courtyard and on the north and east perimeter of City Hall. All aboard the Santa Express! 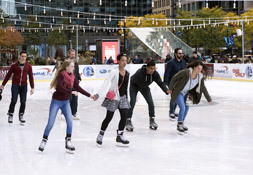 On November 25, 10:30am-Noon, Santa Claus is comin' to the Rothman Rink at Dilworth Park on SEPTA! Board specially-decorated SEPTA trains filled with entertainment for a fun-filled holiday ride to Dilworth Park. Visit iSEPTAPhilly.com for train times and locations. 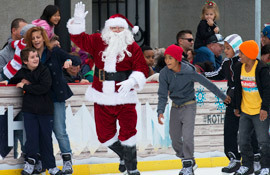 A festive parade will welcome Santa, Mrs. Claus and the elves to the Rothman Rink, where riders are invited to stay and skate with Santa. The rink will be open 10am-11pm. New to Center City is Naturale Salon, a clean, relaxing, and modern space to enjoy your manicure & pedicure. Offensive fumes are eliminated by adhering solely to services for natural nails- no artificial enhancements. All porous items such as nail files, buffers & orange wood sticks will be discarded after each use. Steel implements will be carefully brushed in antibacterial soap, soaked in hospital grade barbicide, then placed in a sleeve, allowing it to bake in a heat autoclave. The grand opening is on November 18. Through the use of stunning imagery and physicality, Seuls tells the powerful story of a man who, as a child, moved to a new country from his home to escape civil war. As he loses himself in a new context and language, he soon realizes that his childhood emigration has begun to compromise his own sense of self—along with his capacity for happiness. Over the course of his performance, the character overcomes his self-doubt and finds release through color, sensation, and dream. Seuls was recently performed at France's La Colline – national theatre, a theater which Wajdi Mouawad joined as the Artistic Director this year. Seuls opens at the Wilma November 29 and runs through December 11. Join Blick Art Materials for a special series of demonstrations by InLiquid Art + Design artists! Every Saturday from 1-3pm, come to Blick Philadelphia for your chance to meet and discuss technique with professional artists from the InLiquid Microgrant program. November 19: Jeremy Sims - Epic Adventures; November 26: Angela McQuillan - Multi-Layered Painting Effects; December 3: Emily Cobb- Gold Leafing on Art Jewelry. Attendees have a chance to win a $50 store card. Preregistration recommended - Seating is first come/first serve. Click here to sign up. Ground has broken for Phase 1 of the Viaduct Rail Park, which will turn a dilapidated quarter-mile portion of the former Reading Viaduct into a vibrant green park with walking paths, landscaping, lighting, seating and gathering spaces. To date $9.5 million has been raised of the $10.3 million project. Help us get to our goal today by making a gift or joining our new crowd-funding campaign.